The Longfellow House has been in our family going on 3 centuries. Trust us when we say it takes a lot of love, blood... sweat... and fears (for those of us who don’t like high ladder work) to maintain our home. That said - one of the truly great things about Cape May is the unique architecture found throughout the town. 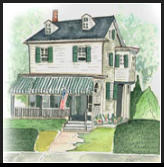 Since 2005, the Mid-Atlantic Center for the Arts (MAC) has presented the Designer Show House for the enjoyment of local residents and visitors. Noted designers from the region have transformed historic properties into gems of modern living and design, while maintaining the historical integrity of the buildings, and restoring them to their former glory. If you’re planning a vacation to the Longfellow House this Fall and enjoy architecture you might want to include a visit to the Designer Show House. This year’s property, the Otis Townsend Residence was built in 1915 and is an outstanding representation of Craftsman-style architecture and that relies mainly on its structural details for ornamentation. The Otis House is located on 115 Reading Ave., Cape May Open through October 19, 2008. Timings are from 10 am to 3 pm daily, and evenings Sunday through Friday, 7pm. Special luncheon and dinner tours also available. Posted on September 8, 2008 by Billy Longfellow.